D S S CO NO 1 (1957) The 41 ton 60 foot wooden scow D S S Co No 1 foundered June 20, 1957 at Hoonah. D S S CO NO 6 (1924) The wood scow D S S Co No 6 was “hauled out on beach and wrecked; not fit for further use” in July of 1924 at Port Althorp on the north shore of Chichagof Island. The wreck report was filed by Thomas E Stone, agent and attorney in fact for Deep Sea Salmon Co February 1, 1929 in Seattle. D S S CO NO 8 (1943) The 33 ton 54 foot wooden scow D S S Co No 8 foundered at the Taku River in 1943. The Dan Jr had left Excursion Inlet and was headed to Icy Straits with two aboard. The vessel was valued at $4,000 at the time of the casualty with no insurance. There was no cargo listed. DANUBE (1986) The 43 foot wooden troller Danube sank while on a crabbing trip October 30, 1986 a quarter mile southeast of Marmion Island southeast of Juneau. The vessel had a white hull and red markings and was reported overdue October 30th. A subsequent search revealed wreckage washed up on Douglas and Admiralty Islands and an oil slick between the two. Owner W. Scott Lewis and crewmembers Tom Kelly and Bill Tugman, all from Juneau, were never found. DARDANELLA (1934) The gas screw Dardanella stranded and was lost Wednesday August 8, 1934 at 1:00 a.m. at Barlow Point in Stephens Passage. The vessel had departed Juneau and was travelling to East Point in Chatham Strait with three persons aboard. The survivors made it back to Juneau in a small boat. According to Esther Ellsworth, the master and part owner, the vessel was overpowered by the tide rips and taken ashore. She was laden with 7 tons of groceries and clothing valued at $400. The Dardanella was valued at $4,000. Both the vessel and cargo are listed as total losses with no insurance. DAVID T (1999) The 32 foot salmon fishing vessel David T was consumed by a galley fire and lost July 7, 1999 in Refuge Cove near Ketchikan. There was no one on board at the time of the disaster. DAYLIGHT (1979) The 37 foot troller Daylight capsized and was lost in heavy weather November 30, 1979 in Seven Fathom Bay 18 miles south of Sitka. Owner Neland J Haavig and Norman Wilson had been deer hunting in the area when a 40-50 mile an hour gale came up. The men attempted to depart the bay in the Daylight but were blown onto the rocks. They were barely able to get out a May-Day before the Daylight was capsized by the winds. Soon a U S Coast Guard Helicopter hoisted the men to safety and transported them to the Sitka Hospital to be treated for hypothermia. DEANN (1996) The 25 foot fishing vessel Deann sank December 3, 1996 off of Fish Egg Island. All three persons on board made it to safety. DEAR JOHN (1969) The gas screw Dear John was consumed by fire August 26, 1969 one and a half miles north of Funter Bay in Chatham Strait. DEBBIE ANN (1989) The 32 foot wooden longline halibut fishing vessel Debbie Ann grounded in heavy weather, capsized and sank May 16, 1989 in Roller Bay. Both crewmembers made it to safety. DECORA (1971) The fishing vessel Decora struck a reef and sank February 3, 1971 on Colorado Reef in Wrangell Narrows. All five crewmen were taken off of the Decora by the U S Coast Guard Cutter Henlopen. DEFIANCE (1986) The fishing vessel Defiance sank May 31, 1986 approximately 15 miles southwest of Cape Spencer. All four crewmembers were rescued by the fishing vessel Adak. There were two crewmen aboard the Defy at the time of the casualty, both survived. They had been fishing and had 6,000 lbs of fish aboard valued at $150. The Defy was valued at $2,000. All was lost when the vessel sank; there was no insurance. The crew survived the casualty but the Delhi, valued at $125,000 was lost. She was insured for $90,000. DELIGHT (1920) The 11 ton 35 foot gas screw Delight was lost at Ketchikan February of 1920. The Delight was valued at $700 with cargo. The vessel broke apart while on the ways. DELL (1948) The 8 ton 36 foot wooden gas screw fishing vessel Dell was destroyed by fire August 17, 1948 near Haines, opposite the Chilkat River in Lynn Canal. DENNY JO (1952) The 38 ton 50 foot wooden oil screw fishing vessel Denny Jo foundered November 24, 1952 in Stag Bay, Lisianski Strait, near Cape Spencer. DENTIST (1963) The 274 ton 80 foot wooden barge Dentist burned in November of 1963 at Nakwasina, 20 miles north of Sitka. DENVER (1968) The gas screw Denver burned January 1, 1968 at Juneau. DEPERE (1929) The 3,475 ton 320 foot Alaska Steamship Company freighter Depere ran up on the rocks off of Cape Decision at 6:55 P.M. November 15, 1929. A storm in the area was said to have contributed to the disaster. There were 35 persons aboard. The vessel was beached near Port McArthur an hour after striking and was in a sinking condition. All but a few of her crew abandoned ship and camped nearby. With the assistance of the U S Coast Guard cutters Unalga and Cygan and the salvage vessel Salvage King, the Depere was eventually refloated and towed south to Tacoma. The Detroit was valued at $14,200 at the time of the wreck and had neither cargo nor insurance. DEWET (1909) The 14 ton 36 foot gas screw schooner DeWet burned at Ketchikan October 24, 1909. DIAJAC (1954) The 10 ton 30 foot wooden gas screw Diajac burned September 9, 1954 in George Inlet. DIAMOND C (1930) The wooden gas screw Diamond C caught fire and exploded while taking fuel at The Union Oil Dock at Wrangell Thursday April 17, 1930 at 4 p.m. The two man crew could do nothing but cut the vessel adrift from the dock. The Diamond C was valued at $1,600 with no cargo or insurance. DIANA (1965) The 8 ton 28 foot wooden gas screw Diana foundered January 6, 1965 in the small boat harbor at Juneau. DIANA (1965) The 7 ton 30 foot wooden gas screw fishing vessel Diana was consumed by fire July 27, 1965 in Taku Inlet. DIANA (1966) The 13 ton 37 foot wooden oil screw fishing vessel Diana burned August 10, 1966 in Judd Harbor on Duke Island. DIRIGO (1914) The 843 ton 165 foot steam powered schooner Dirigo foundered while in tow of the vessel Cordova off of Cape Spencer November16, 1914. The crew of 13 was taken aboard the Cordova. DISCOVERER (1969) The passenger and freight boat Discoverer was driven ashore and lost after suffering engine failure July 21, 1969 in Cordova Bay off of Sukkwan Island. All those on board escaped to the beach. Source: U S Coast Guard Report of Casualty filed Sept 29, 1926 signed by W J Hansen secretary for the owners. DISPATCH (1890) The 10.27 ton wood steamer Dispatch dragged anchor in a storm, blew ashore and was wrecked January 22, 1890. The casualty occurred on the east shore of Seymour Canal On Admiralty Island, 15 miles NW of the mouth of the canal. None of the three crew were lost but the Dispatch, valued at $4,500 was damaged to the tune of $3,000. She was towing a barge from Juneau, having left December 9, 1889. DIVEMASTER (1996) The 30 foot steel fishing vessel Divemaster struck a submerged object and sank July 4, 1996 approximately 20 miles south of Wrangell. The only person aboard made it to safety. DIXIE (1950) The 10 ton 34 foot wooden gas screw fishing vessel Dixie stranded and was lost November 15, 1950 near Cape Cross in the Gulf of Alaska. Owner Fred Wetche, his 14 year old son Fred Jr. and Helvig “Chris” Christensen were returning to Pelican from a hunting trip when heavy weather forced them into the rocks near Cape Bingham on the north end of Yakobi Island. Only Christensen survived hanging on to Yakobi Rock. He was rescued barely alive two days later by Pelican residents Tom Allain (34), Betty Mork (15) and Marie Mork (13) who found him still clinging to Yakobi Rock. The three rescuers received the U S Coast Guard Meritorious Service Award for their harrowing rescue of Christensen using a 32 foot vessel poorly equipped for the task. DIXIE (1962) The 8 ton 30 foot wooden gas screw fishing vessel Dixie foundered September 7, 1962 in Kasaan Bay. DONA S (1964) The 106 ton 70 foot wooden oil screw fishing vessel Dona S foundered off of Baranof Island May 10, 1964. DORA R (1972) The 60 foot purse seine fishing vessel Dora R foundered in Peril Strait 75 miles south of Juneau November 19, 1972. Ronald Hanson, skipper of the vessel was “plucked out of the water” by a helicopter crew and taken to a hospital with extreme exposure. 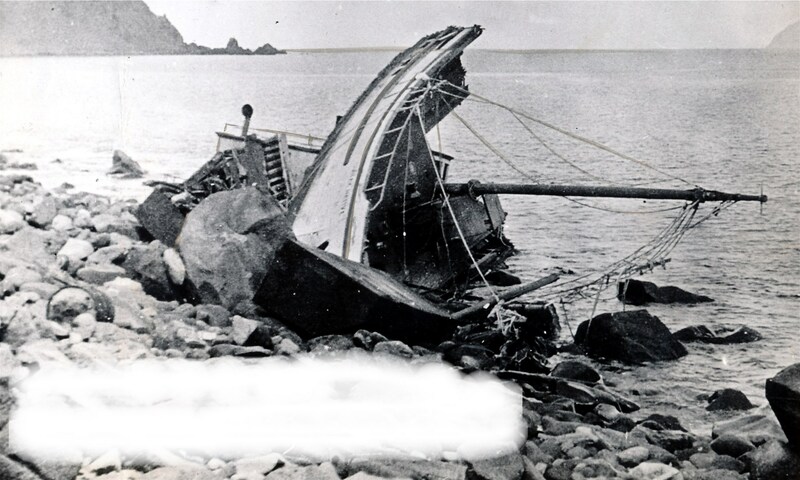 Crewmembers James Pope and Roy Robal were lost with the Dora R.
DORIS (1952) The 7 ton 32 foot wooden gas screw fishing vessel Doris burned September 19, 1952 halfway between Neva Strait and Olga Strait. DOROTHY (1967) The gas screw Dorothy foundered November 23, 1967 off of Hemlock Island. DORTHY M (1938) The 11 ton 35 foot wooden gas screw fishing vessel Dorothy M caught fire from an engine backfire at 9:00 a.m. March 14, 1939 at Meyers Chuck. Eight Pyrene cans were emptied in an attempt to extinguish the blaze. Crewman Bill Hansen shot a hole in the vessel with a shotgun and sunk her. Chris Lading Jr., master of the Dorothy M and crewmen Hansen escaped unharmed. The vessel, valued at $2,000 and insured for $1,000 was later salvaged. Damage was estimated to be only $400. DOT (1957) The 15 ton 38 foot wooden gas screw fishing vessel Dot was consumed by fire December 3, 1957 at Craig. DOVE (1920) The 26 ton 48 foot gas screw Dove stranded and was lost at Cape Ommaney March 15, 1920. Two of the five persons aboard perished in the disaster. DOWNEASTER (1986) The fishing vessel Downeaster flooded and sank June 1, 1986 between Eldred Rock and Sullivan Island in Lynn Canal. Both crewmembers escaped to a raft and were picked up by the fishing vessel Genevieve. DRIFT (1967) The 12 ton 39 foot wooden gas screw fishing vessel Drift was consumed by fire July 20, 1967 at Slaughterhouse Cove in Dixon Harbor. DRY HEAT (2001) The 32 foot pleasure vessel Dry Heat burned and sank July 22, 2001 near Streets Island 10 miles west of Ketchikan. Four adults and five children abandoned ship to the icy waters. The vessels Show Girl and Sheltered Seas responded to the distress call and rescued all nine. The Dry Heat sank in 200 fathoms of water. DUBROVNIK (1948) The 31 ton 49 foot wooden gas screw fishing vessel Dubrovnik burned September 20, 1948 at Klawock. DUCK (1976) The converted military landing craft Duck struck a submerged log and sank July 25, 1976 near Saint Marys Point just north of Ketchikan. The vessel had been converted to a house boat and a family was travelling north up the inside passage when the disaster occurred. DUCKLAND (1922) It was 2:00 a.m. Sunday October 29, 1922 when the 42 foot wooden gas screw fishing vessel Duckland drug anchor and stranded with two persons aboard. The Duckland’s master and owner, Peter Beaudrie and his only crewman were able to escape, but the Duckland, valued at $1,200 became a total loss. Beaudrie had left Wrangell on the 22nd and was “cruising for timber”. The casualty occurred at the mouth of Anita By on the NE coast of Etolin Island. DUPOCO II (1942) The 8 ton 31 foot wooden gas screw Dupoco II burned at Juneau January 14, 1942. DURI (1941) The 10 ton 36 foot wooden gas screw fishing vessel Duri stranded and was lost on Biorka Island near Sitka February 4, 1941. The two persons aboard made it to safety.